For a world going paperless, there’s still an awful lot of paper around. And when you’re in a meeting with a group of people, scribbling ideas and diagrams on a whiteboard is still more efficient than trying to collaborate on one computer. But when it’s time to actually do work with all that paper and all those whiteboard images, Microsoft has a new way to get them into your computer and ready to edit in the Office apps you use every day. It’s called Office Lens, and it launched Thursday for the iPhone. 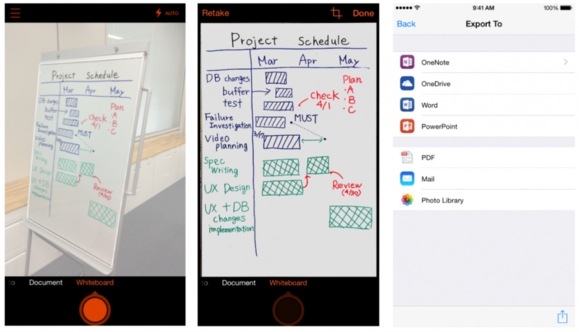 Office Lens is a free app that works like scanning apps you may have used already—you use your iPhone’s camera to capture a document or a whiteboard, and they’re stored in the cloud and made searchable thanks to OCR. The difference with Office Lens is that you don’t just get flat images of your documents. 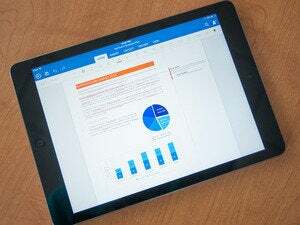 Office Lens converts the image to editable Word, PowerPoint, and PDF files, in native Office formats, saved to OneDrive so they’re accessible from any other device. Office Lens aims to make the process as easy as possible. 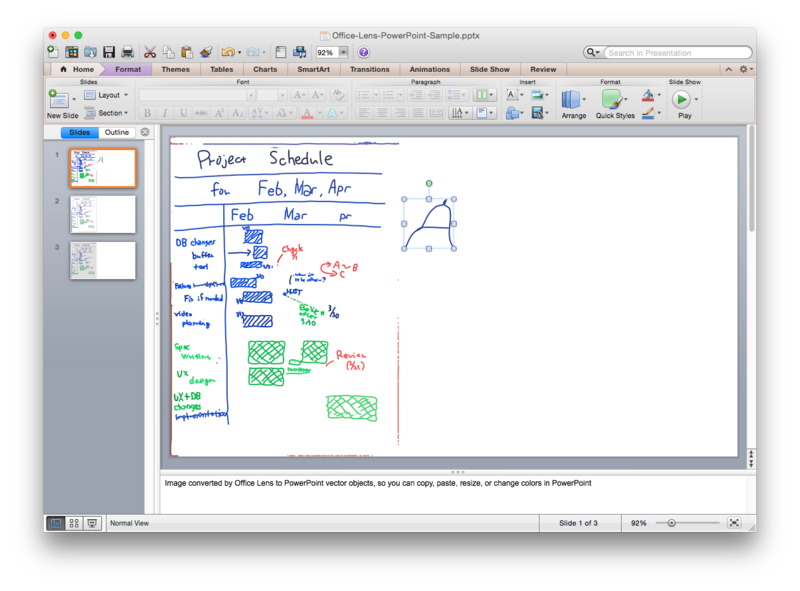 The capture screen has three modes: Photo, Document, and Whiteboard. In any mode, the app recognizes the corners of what you’re photographing, so you don’t have to crop or straighten anything manually—you can even shoot at an angle. There’s still a crop tool if you only need part of what was captured, or if the app gets it wrong. If you swipe to Whiteboard mode, the app will attempt to remove glare and shadows. Once the capture looks good, you tap Done to see a list of export options. Photos are exported in JPG format or PDF. Documents can become Word (DOCX) files or PDF. Whiteboard images become PowerPoint (PPTX) or PDF files. You can send these to OneNote or OneDrive, or even save images to your Camera Roll or attach files to a new email. Yup, editable files. Typed text becomes editable text, ready to be cut and pasted and changed—and dare we say spell-checked. When you convert a whiteboard sketch into a PowerPoint file, every line you drew becomes a PowerPoint drawing object that you can recolor, resize, move, and edit. That’s great for lines and boxes and arrows, but if your whiteboard has a lot of text on it, it’ll probably be faster to just retype it—or use the slide as-is in your presentation. Once your image is in PowerPoint, you can slide each object around, including letters. But you can't just select a whole word and retype it. If you capture a business card and send it to OneNote, all the contact information is parsed out, and Microsoft’s blog post says you can save this contact to your phone, but figuring out how took a few tries. Here’s the trick: Below the (editable) list of contact information, you’ll see a little icon that represents a VCF file. Tap that to open it, and then you’ll see options to Create New Contact and Add to Existing Contact, as well as a Share button to send the VCF file elsewhere (Messages, Mail, Evernote, whatever compatible options you have on your iPhone). 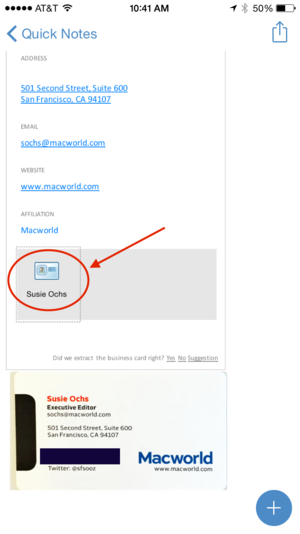 You can scan business cards into your contacts, but it's a two-step: Office Lens to OneNote, then find the VCF file in OneNote (circled here) and tap it for the options to add it to your phone's contacts. 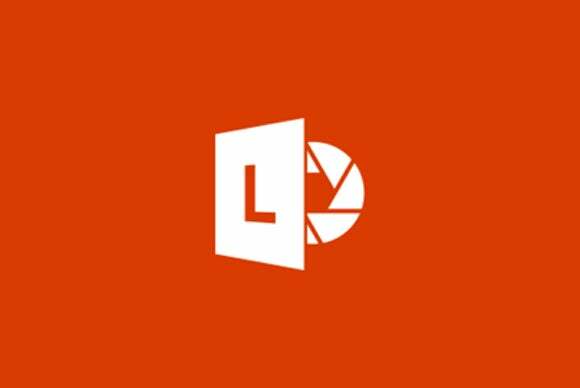 Office Lens is free in the App Store, and requires a free Microsoft account, so it can send images to OneDrive and OneNote.